The special feature of amotIQ is: every single employee provides longstanding process experience from the automotive industry and meets amotIQ´s customers at eye level, a professional competence that makes amotIQ an important partner of the OEM and the supplier industry until today. Your amotIQ consultants will listen carefully, capture the most complex coherences and conceptualize practical and customized solutions which will make your life easier. amotIQ always acts in your interest, amotIQ speaks your language, is reliable, competent and dedicated. 24 hours a day! Every day! amotIQ develops customized project solutions and process models for all manufacturing branches. AmotIQ automotive has been part of the amotIQ corporate group since 2004. Including its partnes in Saarbrücken, Bonn, Düsseldorf and Munich amotIQ has access to almost 100 specialists. The three managing directors Peter Heidecke, Frank Mysliwitz and Andreas Prescher founded the current amotIQ aut0motive with an equity capital of 100.000 Euros. At first the company headquarters were in the Rober-Bosch-Straße in Heilbronn. 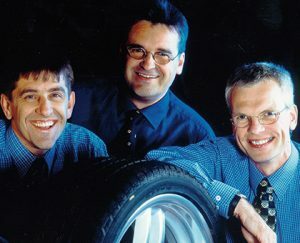 In the new company Peter Heidecke was responsible for marketing, Frank Mysliwitz for consulting and Andreas Prescher for the development of products. Part of the team were eight other shareholders – computer scientists, industrial engineers, business economists/management experts and scientists – they were all visionaries with a strong sense of responsibility. Two years after the company was founded 22 employees were already working for the company and the turnover was 3.2 million Euros. amotIQ became the amotIQ Group after merging with five other companies. The amotIQ software solution PreisCockpit was certified by Dr. Ing. Stahl and Herold GmbH Wirtschaftsprüfungsgesellschaft (accounting firm) und Steuerberatungsgesellschaft (tax consultancy firm) in Heilbronn. amotIQ PriceCockpit enables the comfortable transfer of price data from the supplier´s WEB portal into your SAP-system. The data that has already been converted into XML format and tranferred, is selected from a preset register. This data is compared with recorded prices and neatly displayed on the screen. Our IT innovation solutions are among the best in the industry. amotIQ was awarded with the “PreisCockpit” in the category of e-commerce. At the world’s largest computer trade fair CEBIT, amotIQ received the IT Innovation Prize for the most innovative and SME-suitable IT solution. The company amotIQ automotive moves into the prominent Heilbronn QBig One in the Lise-Meitner-Straße 6 in the commercial area Schwabenhof. With IDOC Monitor, the linking of JITplant with SAP will succeed in the future. This linking makes qualified monitoring of incoming EDI messages from JIT-Plant in SAP possible. IDOC Monitor simplifies controlling of incoming SHPMNT IDOCs from JITplant. amotIQ automotive ports the proven functionalities of JITplant to the current version of Microsofts.NET Framework. With this, amotIQ JITplant meets the increasingly complex requirements and constantly developing technology. Our status has been raised by the new partner program SAP Partner Edge. As a service partner, we advise medium-sized companies and corporations on the conception, development, implementation and integration of SAP solutions. Due to the closeness to SAP we are able to work with the latest releases, we know which software components work well together or how to enable communication between individual elements. As Silver Partner of SAP and its solution portfolio we can, for example, through exclusive self-improvement, analyze customer problems more specifically and discover new business opportunities. amotIQ automotive GmbH is one of the best IT consulting companies in Germany, specialized in medium-sized companies, and may call itself TOP CONSULTANT 2016. TOP CONSULTANT mentor and former President of the Federal Republic of Germany Christian Wulff has acknowledged our company. For many years, amotIQ has been active by helping children and adolescents as well as supporting education. amotiQ provides for example regular supervision for students writing their bachelor’s and master’s theses or the placement of internships, starting from the so called Bogy-internship for school to the internship semester for university students. From 2016 on, amotIQ became partner of the HHN Racing Team at Heilbronn University, sponsor of the VFV Association for Traffic Education e.V. and dual partner of the DHBW Mosbach. amotIQ was founded on December 21 in 2000 and was registered in the register of companies. In December 2017, amotIQ has grown up. In the upcoming anniversary year 2018, amotIQ will appear with a new CD, a revised logo and a modern web presence. In spring of 2018 the relaunch of the website of amotIQ automotive is taking place. At amotIQ.de we appear with informative content, modern design, clear structures and of course “responsive”. Everything in the style of the new amotIQ CD and with a new logo. The new amotIQ logo continues to be based on the classic brand emblem but has become more minimalistic in design. The wings and tail of our “Justin” has lost their woodcut-like, filigree style and has become smoother and more mature without losing the character of the fast roadrunner. In terms of color, the bright blue and orange of the former start-up company have been transformed into the new, deep and confident amotIQ lead and spot colors blue and orange of a successful consulting company. amotIQ´s uniqueness is exceptional based on the multidimensional competence of all employees at amotIQ. Every single employee at amotIQ has longstanding project experience in the automotive sector. Our amotIQ consultants are equipped with experienced personalities and are therefore consultants, project managers, developers, logistics and process consultants – in one person. amotIQ is the missing piece in the puzzle of all processes and works with integrative abilities and competence. amotIQ automotive GmbH is part of the amotIQ Group and offers logistics and process consulting as well as IT solutions for manufacturers, suppliers and service providers. The common core competence of the amotIQ Group is automotive logistics. amotIQ stands for pragmatic, practice-oriented and intelligent approaches, know-how and international project experience, with and without SAP. Why is friendly “Justin” on the amotIQ logo? The agile roadrunner “Justin” in the amotIQ logo stands for the company´s speed and roadholding. The reason is that amotIQ always reacts flexible, straightforward and promptly towards its customers. Due to its speed and its cooperative attitude the fast-paced company has few natural enemies. At amotIQ there is no “you and us”, just “us together” as a team! Based on this, amotIQ´s success can be traced back to two factors: its qualified, motivated and process-experienced employees and the industry-oriented, competent, SME-oriented approach in projects. This fact is also confirmed by satisfied amotIQ customers, who repeatedly attest closeness, collegiality and humanity to amotIQ. When will you try to find out if amotIQ suits you? Why is friendly „Justin“ on our logo? The likeable roadrunner is an extremely good runner. He is the world´s fastest bird with the ability to fly and is able to reach a maximum speed of up to 42 km / h. Sometimes amotIQ is even faster than “Justin”. Like the experts at amotIQ automotive, the roadrunner always stays on the ground (despite having the ability to fly at high altitude). Rarely, and only if necessary, does the roadrunner take off or glide to his next destination. Roadrunners like to run on plantless ground such as dry riverbeds or roads. The smart bird uses his tail like a rudder to change direction. This shows that the roadrunner has automotive talents and is flexible just like the experts at amotIQ automotive. The smart bird has developed an energy-efficient method to adapt to the different daytime and nighttime temperatures in the desert. amotIQ is also the flexible specialist for changing processes. In the culture of indigenous peoples, such as the Hopi, the roadrunner stands for strength, perseverance and courage. Since he hardly ever takes off, the trail of his characteristic footprints never seems to end in the desert sand. The most famous Road Runner is the character of Chuck Jones, who appears in cartoons by Warner Bros. productions Looney Tunes and is always unsuccessfully chased by Wile E. Coyote. It’s not the size that counts. It is experience and skill that does!